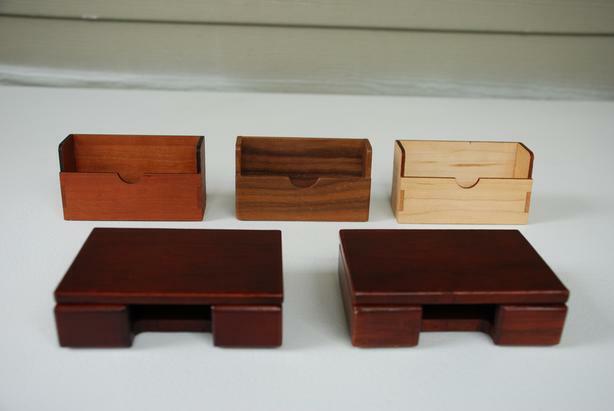 I have three wooden business card holders all hand-made by a local fine arts woodcrafter. One is walnut x 1 (4"L x 2.5"W x 2"H), one is Black Cherry x 1 (4"L x 2"W x 2"H), and one is Silver Maple x 1 (4"L x 2"W x 2"H). They originally cost $25 each: I am asking $15 each. I have two matching wooden (deep umber brown) holders to store business cards with a hinged lid. Their unique feature is that they are stackable (or will hold other small items). They each measure 4.25"L x 2.75"W x 1.25"H with non-slip feet on the bottom. I am asking $15 for both. I am located in Vancouver, BC but shipping is no problem. I will be happy to mail these business card holders to you using CanadaPost and Interac bank transfer. So, if you are interested in purchasing, e-mail me and we'll figure out the logistics and/or I can answer any questions you may have. Thanks!